Vatican report concludes: “Women religious have courageously been in the forefront, selflessly tending to the spiritual, moral, educational, physical, and social needs of countless individuals." In mid-December, the Vatican released its final report on a multi-year investigation into how American sisters live, work, and pray. The report was largely postive and expressed gratitude for the sisters' ministry and witness. “Women religious have courageously been in the forefront, selflessly tending to the spiritual, moral, educational, physical, and social needs of countless individuals,” the report said. The Final Report on the Apostolic Visitation of Institutes of Women Religious in the United States of America resulted from a visitation beginning in 2008 "to look into the quality of the life of religious women in the United States." It was initiated because "apostolic religious life in the United States is experiencing challenging times." Brother Paul Bednarczyk, C.S.C., executive director of the National Religious Vocation Conference (VISION's parent organization), shared his thoughts on the report with America: "Religious sisters are an essential and formidable force in the life of the church. They have managed hospitals, schools, and universities and have forged innovative, effective ministries to meet the needs of the poor with little money, but with great vision and determination. I applaud the Congregation’s acknowledgement of the structural, cultural, and financial challenges women’s religious institutes face in attracting and retaining new members. I am especially heartened by the Congregation’s very clearly stated commitment to work with Pope Francis to find expression for 'feminine genius' and a role for women in 'decision making in the different areas of Church life.' During this Year of Consecrated Life, Pope Francis invites all religious to look to our future with hope." The Global Sisters Report said of the report: "Using some form of the word 'gratitude' eight times over its 12 pages, the report also acknowledges the suspicion many sisters had over the launching of the investigation and says the Vatican is seeking 'respectful and fruitful dialogue' with those who refused to collaborate in the process." Although the number of those in religious life is diminishing, support for these challenges is present in the report. The Year of Consecrated Life will offer even more opportunities for the laity and religious to experience the charisms, community, and grace of consecrated life. Super-typhoons caused by climate change have devastated many areas of the Philippines. Father Amado Picardal will ride his bike from Manila to Mindanao in the Philippines to raise awareness about climate change and its victims. Recently, super-typhoons have devastated many areas of the country, forcing citizens to rebuild. Picardal wants to draw attention to the problem and will be advocating for change while biking through sites where the typhoons hit. Picardal has done advocacy rides before, when he was younger, but the recent changes in climate inspired him to ride once more. Contemplative Carmelite communities from Spain (left) and Southwest England (right) doing "everyday" things. Two different blogs recently captured the lives of Carmelite sisters with stunning photographs. Carmelites are monastic, contemplative, and apostolic in character. One of the Carmelite communities featured is the Convento de Santa Teresa in Spain. Photographer/writer Lori Needlman shares of her experience: "The monjas (nuns), about ten or so, flashed smiles and passed their hands through the bars to be held by us. In utter chaos, each monja asked questions, laughed, and smiled. They were excited to have us visit on the day of my nephew's communion! This informal dance kept on for some time. I stood back observing and feeling lucky to be able to meet the monjas. This hidden part of Spanish culture is not something you can see as a tourist." Visit her blog, on the Huffington Post, here. Visit her site to view more photos here. The Everyday Lives of Nuns, a photo blog by David Rosenburg, features a series called “Sisters of Sclerder” by Ibolya Feher. Rosenburg writes, "It’s one thing to decide to create a photographic series about an enclosed contemplative monastery; it’s another to make it happen. Determined to create a series about a world that seems almost otherworldly, Ibolya Feher went the modern route and did a Google search to find the monastery closest to her home in Southwest England. That turned out to be the Sisters of the Carmelite order, who live in Sclerder Abbey, about a three-hour train ride away. The Carmelite order is one of the oldest contemplative orders in which the sisters live and work primarily in silence and rarely allow outsider visitors." Friar Gabriel shares his gift of skateboarding; Father Joshua Johnson raps Jesus' word. Friar Gabriel, as he's simply known, of the Franciscan Immaculate, skated for seven years as a teenager, but felt his vocation was religious life. He gave up his passion for skateboarding to live a life of poverty, chastity, and obedience. Six years later, he was given permission to obtain a skateboard and go to the skatepark once a week. Skateboarding allows him to help others see the compatibility of exercising the body as well as the soul. A newly-ordained priest in the Diocese of Baton Rouge, La., Father Joshua Johnson uses the medium of rap music to communicate his message. “We need to immerse ourselves in Jesus’ word so that he can speak truth to us,” he says. Even if some skeptical young people aren’t totally convinced of his message, they at least hear him out, since it's not every day that you meet a priest who raps. Societies of Apostolic Life, will preside over the opening mass for the Year of Consecrated Life. This year, the first Sunday of Advent, which marks the beginning of the liturgical year, is the start of the Year of Consecrated Life, which begins Nov. 30, 2014 and ends Feb. 2, 2016 on the World Day of Prayer for Consecrated Life. Because Pope Francis will be on his apostolic trip to Turkey from Nov. 28-30, News.VA reports that the mass to open the Year of Consecrated Life will be celebrated by Cardinal João Braz de Aviz, prefect of the Congregation for Institutes of Consecrated Life and Societies of Apostolic Life. Nov. 30, 2014: The Year of Consecrated Life begins (First Sunday of Advent). Feb. 8, 2015: Religious Open House. Events will be coordinated to also celebrate the World Meeting of Families to take place in Philadelphia and will include tours, open houses, receptions, family activities, and presentations on the history of religious communities at convents, abbeys, monasteries, and religious houses. Summer 2015: Day of Mission and Service with Religious. Events will include joining religious in their apostolates or special service projects, such as assisting the elderly, ministering to the poor and homeless, and caring for the less fortunate. Sept. 13, 2015: Day of Prayer with Religious. Events will include vespers, rosary, or holy hours in convents, monasteries, religious houses, parishes, and churches. Feb. 2, 2016: The Year of Consecrated Life closes on the World Day of Consecrated Life. View resources on the Year of Consecrated Life from the USCCB and VISION. Sister Jean Marie Craig teaches fitness to her college students. Sister Jean Marie Craig believes nourishing both the spirit and the mind are important to living a healthy life. That’s why this 80-year-old Sister of the Blessed Sacrament is still teaching aerobics classes at Xavier University of Louisiana in New Orleans. An alumnus of Xavier herself, Sister Craig has been teaching physical education and CPR/First Aid for 32 years. While some may think taking an aerobics class from a nun is easy, her students say otherwise. “She challenges us every class and she wants us to do our best. She’s definitely hard-core for a nun,” junior Leticia McDaniel said. Sister Craig understands the importance of physical fitness and what a blessing it is to be able to move. She wants to instill healthy habits in her students. “If you stop exercising, it’s a lot harder to get it back," she said. Vocation director Sr. Marilyn Schauble believes that technology helps play a role in increasing vocations. For the first time in nearly 20 years, four women entered the monastic religious order at Mount Saint Benedict Monastery in Erie, Pa. In a recent article from Faithlife, vocation director Sr. Marilyn Schauble, OSB, said of the vocations, "It's new life, it gives you a little spark." Schauble explained that all of the women are in their 50s, each of them researched several other religious communities before committing, and all have been working with Erie's inner-city poor. VISION executive editor Patrice Tuohy said that the overall numbers of people entering religious communities are beginning to increase slightly. Tuohy attributes this to religious communities using the Internet to attract new members. Schauble similarly finds her vocation ministry responses must be quick and efficient via email and text to draw in younger women. "You always have to think of the future of the community," Schauble said. Discover more about the Benedictine Sisters of Erie. Check out the "Guide to growing your community in the digital age" for tips on how to reach young, energetic discerners of the modern world. Fr. Bernard Kinvi, OSCAM, is saving the lives of Muslims by sheltering them in the Central African Republic. Camillian priest Fr. Bernard Kinvi, OSCAM, is saving the lives of Muslims by sheltering them in the Catholic mission hospital he directs in Bossemptele, Central African Republic (CAR), according to The Guardian. Since March 2013, this former French colony has been experiencing what is described by one United Nations official as "a massive ethnic-religious cleansing." Kinvi’s efforts to protect the Muslims of Bossemptele have been recognised by the international NGO Human Rights Watch, which recently bestowed on him its Alison Des Forges award, which honors “people of valour who have put their lives on the line to create a world free from abuse, discrimination and oppression." The best of VISION Vocation Guide has been published as an ebook, ‘Discover Your Path,’ available on Amazon at http://www.amazon.com/dp/B00PKHUP08. To that end, the articles collected in 'Discover Your Path' will help discerners pound out and pull together information and insights into where God might be calling them—a process often referred to as “vocation discernment.” May the readers of 'Discover Your Path' find it useful as they seek the vocations within themselves. Documents of Saint Francis of Assisi displayed in U.S. Medieval manuscripts from the Sacred Convent of St. Francis in Assisi. For the first time in 700 years, 13 restored medieval manuscripts rom the Sacred Convent of St. Francis in Assisi will leave Italy and be displayed in the United States. According to the New York Times, the documents will be at the United Nations headquarters in New York City Nov. 17-28 and then open to the public in Brooklyn Borough Hall until mid-January in an exhibition, "Friar Francis: Traces, Words and Images." According to news reports, "historians agree that he most likely dictated his writings, but certainly his hand touched the papal bulls that in the 1220s registered the pope’s messages to the order." Sr. Teresa Forcades promotes Catalan independence. The Catalan region of Spain is moving toward voting on independence, and Sr. Teresa Forcades has been active in the political discourse surrounding the issue. She is an intellectual, doctor, political activist, but most importantly, a nun, saying, "That’s clearly my primary identity, because that gives me the sense of belonging, the sense of stability." Over the past few years, Forcades has become one of the leading intellectuals in Europe, commenting on everything from independence to feminism to capitalism, while also working in the medical field, but her views have not been without controversy. Many believe that she is too outspoken on certain issues, but this has not stopped Forcades from sharing her opinions, and as the vote on independence nears, she has been a key activist for Catalan independence. On Sunday, voters will decide two issues: Catalan statehood and whether that state should be independent from Spain. Forcades says she will vote yes to both and challenges the government’s opposition to the referendum, saying, “It’s an attempt to prevent the people of Catalonia from expressing themselves and I think it’s a fear of ascertaining that in Catalonia today a majority wants independence." Br. Timothy Danaher, O.P., with his parents William and Theresa. In a recent interview with the National Catholic Register, Bishop Michael Burbidge of the Diocese of Raleigh, N.C., and chair of the U.S. Conference of Catholic Bishops' Committee on Clergy, Consecrated Life and Vocations, discusses the important role family plays in the conversation about consecrated life. “The family has to be the foundation from which good vocations are received or planted and the seeds are nurtured. That can be related to vocations with the diocesan priesthood. So much of our work has to be with parents and families to help them understand what this life is and their role in encouraging their sons or daughters, when it comes to consecrated life, and to have their hearts open to it. That was presumed before. There was a time in history when, even when I was a seminarian … that was a given," Burbidge said. “So that’s where we have to do much better work: to be nurturing and helping the parents. That has to be the essential part of vocation work, so we’re not just going to say we need our young people to learn about consecrated life, but their families need to be involved, too." For more on this topic, read Fr. Andrew Hofer’s article "How to talk to your family about your vocation." Catholics called to build a "culture of vocations"
The 2014 National Vocation Awareness Week (NVAW), Nov. 2-8, will be celebrated in U.S. parishes as a special time to "foster a culture of vocations for the priesthood, diaconate, and consecrated life." Pope Francis emphasized the culture of vocations in Evangelii Gaudium, proclaiming: "The fraternal life and fervor of the community can awaken in the young a desire to consecrate themselves completely to God and to preaching of the Gospel. This is particularly true if such a living community prays insistently for vocations and courageously proposes to its young people the path of special consecration." The observance of NVAW is sponsored by the United States Conference of Catholic Bishops' (USCCB) Committee on Clergy, Consecrated Life and Vocations. The organization has created a variety of NVAW resources including news releases, videos of daily reflections, homily points, Holy Hours for Vocations, Prayers of the Faithful, prayers for vocations, and other resources such as lesson plans and activities. Nov. 30 marks the beginning of the Year of Consecrated Life. Check out the VISION Year of Consecrated Life section on our website for articles, resources, and the commissioned song “Wake the world with dawning joy," in honor of this celebratory year of consecration and discipleship. 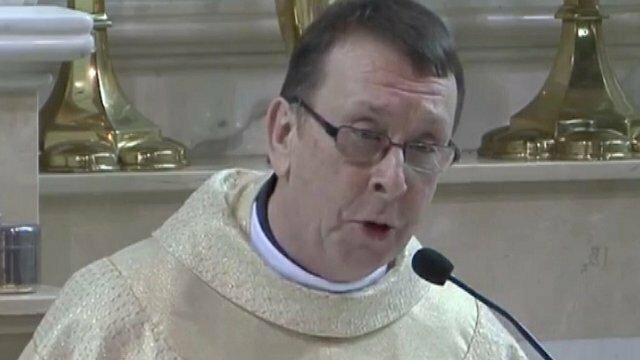 A YouTube video has gone viral of seminarians Rev. David Rider, 29, of Hyde Park, New York, and Rev. John Gibson, 28, of Milwaukee, from the Pontifical North American College in Rome, tapping and Irish dancing in front of a crowd for a fundraiser in April at the college. Rider attributes his vocational calling to Pope John Paul II. In a 2012 CNS video interview, "David Rider: Off Broadway," Rider speaks of the death and funeral of his "hero": "I saw the way he [Pope John Paul II] impacted the entire world for the choice he made for the priesthood. I felt well up within me also the desire to follow in his footsteps and become a priest." Despite a promising theatre career before him, Rider chose the priesthood and now dances "with the desire to bring forward the Kingdom of God," proudly wearing his collar. On the heels of the dancing priests, Sister Cristina, the winner of the TV show, ‘The Voice of Italy,’ has released her first single: "Like a Virgin." According to the RNS report, "Sister Cristina, 26, says her version of the salacious pop song is a 'testimony of God’s capacity to turn all things into something new' as well as her personal calling to be a nun." Little Sisters of the Poor from the Baltimore, Brooklyn, and Chicago provinces with the president of Franciscan University and the Minister Provincial of the Sacred Heart Province receive the 2014 Poverello Medal. The Little Sisters of the Poor, who “through their vocation wish to give quiet witness to the dignity of every human life, until the very end,” were recently awarded the Franciscan University of Steubenville's highest non-academic award, the Poverello Medal. Named after Franciscan University's patron, Saint Francis of Assisi, who was known as “Il Poverello,” (the little poor man), Sr. Loraine Maguire, provincial superior of the Baltimore province, said, "I see in this medal the symbol of all the things that matter: to be poor, little, humble, and merciful to all those we serve; to treat others as Christ himself, and to live in a manner that reflects his very life." The main address of the evening was given by Sr. Constance Veit, LSP, national communications director for the congregation. She recounted how Saint Francis of Assisi was horrified by lepers at first and that this same journey "from self to other" was taken by their French foundress, Jeanne Jugan. Veit reminded the crowd that the elderly, who will represent 19 percent of the U.S. population by 2030, "have become the contemporary outcasts" of society. "I urge you to fight against the tendency to marginalize and abandon the elderly, to commit what the pope refers to as 'hidden euthanasia,'" she said. Learn more about the Little Sisters of the Poor and the Little Sisters of the Poor (UK). In the new reality series 'The Sisterhood,' five young women consider joining religious life. The women profiled are all at different points on their faith journey and come from different backgrounds. The Carmelites for the Aged and Infirm in New York, the Daughters of St. Mary of Providence in Illinois, and the Sisters of St. Joseph the Worker in Kentucky agreed to let the series into their establishments for filming. This is the first time cameras have been allowed in convents to profile the discernment process. The show is set to premiere on Nov. 25 at 10pm ET on Lifetime. Congregation of Holy Cross released a special feature, 'Final Vows,' a video highlighting the men who recently took their final vows with Holy Cross in Notre Dame, Ind. "When a religious professes his vows, he consecrates himself to God through the Church, but he also solidifies his bond with his community. From that moment on, he is no longer discerning; he is now and forever our brother in Christ," one of the men in the video says. The purpose of the video is to raise awareness about the importance of final vows in the life of consecrated religious. Martina Purdy bids the BBC goodbye on Oct. 10. One of Northern Ireland's most respected political journalists, Martina Purdy, announced she was leaving her career of almost 25 years to enter a religious congregation. In a statement, she said: "This is a very personal decision. I ask that the media respect my privacy and that of the religious congregation which I am entering, as I face up to the new challenges of my life. I will not be making any further public comment about this matter." However, she was recently spotted on her way to mass with a group of religious from Adoration Convent of the Falls Road in Belfast, and she also took to Twitter to thank the public for their support. In June, VISION posted on Facebook a report from the National Catholic Register that a famous Spanish model, Olalla Oliveros, also left her career to enter religious life. Perhaps moving out of a profession to religious life is more common than we think! On Oct. 1, the United States Conference of Catholic Bishops (USCCB) announced the observance of “Days with Religious” for the 2015 Year of Consecrated Life (YCL). The “Days with Religious” initiatives and resources will help families learn about the consecrated life of religious men and women. Activities will focus on sharing experiences of prayer, service, and community with those living a consecrated life. View more resources from the USCCB and VISION. Sr. Teresa Fitzgerald always knew she had a calling to work with children, and she did so, first as a Catholic schoolteacher and later as an administrator. Then, that calling took her in a new direction. One of her colleagues, who was working with imprisoned mothers with infants, asked if “other nuns would be interested in dealing with older children, giving them a home and offering them the chance to stay in touch with their mothers.” Fitzgerald decided to seize this new opportunity. She went on to start “Hour Children”—named for “the typical hour allowed for visits with incarcerated women”—which houses 70 children. The program offers thrift shops, a day care center, a food pantry, and job training. The residents and nearly all the staff are former convicts. Fitzgerald has made it her goal to help people who society often casts off as those who brought this upon themselves. “For some, there weren’t any choices, it was just a life experience that they were channeled into for whatever reason–economic or personal or addictive issues. But I was amazed and touched by their goodness and their openness…I met very few people who blamed someone. And their resiliency, their hopes and dreams are big,” she says. • Sr. Mara Rutten began her canonical year with Maryknoll Sisters last month. The Minnesota native earned a Doctorate of Philosophy in history at Arizona State University and just completed a year of theological studies with Maryknoll at an intercongregational novitiate program in Chicago. • Nadin William Ospino recently entered the postulancy program of the Crosier Fathers and Brothers. The ceremony was in Phoenix, which serves as headquarters for one of the order’s three provinces. • The Society of Jesus, which has a Jesuit parish and elementary, junior, and high school in the Diocese of Phoenix, welcomed 33 men into this year’s novice class. Their average age is 28, with nearly 40 percent having attended a Jesuit high school or university. View more Year of Consecrated Life resources. Thanks to today’s reality TV, New Jersey is not always associated with holiness, but one of its own is on the way to sainthood. Sr. Miriam Teresa Demjanovich will be beatified in Newark next month, putting her one step closer to canonization. Her beatification is set to take place in the Cathedral Basilica of the Sacred Heart in Newark, N.J. Cardinal Angelo Amato, who heads the Vatican’s Congregation for the Causes of Saints, will say the mass. Demjanovich was born in 1901 in Bayonne, N.J. After earning a degree in literature from the College of St. Elizabeth in New Jersey, she entered the Sisters of Charity in 1925. She died just two years later, but she left behind 26 letters on prayer and spiritual life, written while preparing to take her vows, which were later published as a book that became popular in the 1930’s. She is being beatified after a miracle was attributed to her intercession. A third-grade boy suffered from macular degeneration and lost his vision. His school, run by the Sisters of Charity, prayed for Demjanovich to help the student. The boy regained his sight without treatment after the school’s prayers. The cure was deemed a miracle by the Vatican. Demjanovich needs another miracle attributed to her in order to be canonized. If that happens, she would be only the second American-born person, after Saint Katherine of Drexel, to be named a saint. Sr. Loretta Mann, 85, a Sister of St. Francis of Assisi since 1948, retired from education in 2008, but not from service, and she joined the Neonatal Intensive Care Unit of St. Francis Hospital in Hartford, Conn., as a "cuddler," where she volunteers three times a week. "Mothers who have grown kids or have other responsibilities, they can't be here, but I can," Mann says. As a cuddler, she rocks the babies and keeps them company, often reading books and singing to them. Mann joined the convent when she was 19, knowing she wanted to work with children. She taught in Pennsylvania for two decades and was then sent to The Catholic University of America in Washington, D.C., to get a master’s degree in administration. While she was not happy about the transition at first, she understood that it was part of God's plan. "I always believe that God puts you where he wants you," she says. After working as a principal in Media, Penn., she was placed in the Hartford area as the curriculum coordinator for the archdiocese and later became superintendent, a post she held until she retired. "Did I want to retire? No. But I knew it was time. And do you know what? I was at the St. Francis NICU the very next day as a cuddler," she says. Her services are appreciated by many at the hospital, including Dr. Jose Arias-Camison, the director of the NICU, who says Mann's loving touch helps the infants recover. "As we know, for many years when the mothers come and touch and hold their babies, their vital signs improve. Sister is not their Mom, but it has the same effect," Arias-Camison says. Mann's kind spirit and willingness to help spreads throughout the NICU, and she loves making sure the infants know someone is there. "I have loved every job, every ministry I have been in," she says. "When I gave up teaching, I thought that was the best job in the world, but then I came here." Virtual choir of cloistered Carmelite nuns sing: “Nada Te Turbe” (“Let Nothing Disturb You”) in an original composition by Sr. Claire Sokol. As first seen from the Global Sisters Report-"Ninety-three Discalced Carmelite nuns in 24 countries have reached out of their cloistered monasteries to sing together in a virtual choir honoring St. Teresa of Avila on the 500th anniversary of her birth." With support from the Springfield Dominican sisters, Sr. Kathleen and other tutors began to teach in a church basement. Now, the program is housed in an old convent. Ryan and her staff have taught more than 2,500 students and about 500 have graduated, according to the Tribune report. She and her staff teach women from all over the world, and students in the program can also attend sessions where tutors “read the paper and talk about getting mortgages, good credit scores, car loans, child care, transportation, jobs, kids’ vaccinations.” These are questions that many would not have answered if they did not have Sr. Kathleen or the Dominican Literacy Center. Click here to learn more about the Dominican Sisters of Springfield. FATHER FRANCIS Browne, S.J. took photographs from 1897 until his death in 1960. The Jesuits of the Wisconsin Province had a blog post, "Get off that ship! ", that includes what I found to be the most amazing part of Browne's story: Upon arriving in Queenstown (Cobh), Ireland from Southampton aboard the Titanic, Browne received a small envelope that contained an importantant directive from the Jesuit provincial: "GET OFF THAT SHIP!" That message saved Browne's life, according to the Jesuits, "and set him on the course to becoming a master photographer." Twins, Todd (left) and Gary Koenigsknecht, are among the Class of 2014 newly ordained priests. The New York Times recently profiled newly ordained identical twin priests Todd and Gary Koenigsknecht from Fowler, Michigan who are "among 22 [priests] from their hometown, Fowler, Mich., population 1,224. They officially tie up the leader board with the neighboring village of Westphalia, population 938, which has also produced 22 priests, making for a robust rivalry in both football and Roman collars." "The elevation of religious life here has also had an effect on young women: Westphalia has produced 37 Catholic nuns over the decades, according to diocesan data, while Fowler claims 43. Marita Wohlfert, who is 20, is in the running to make it 44, having professed her first vows last year with the Servants of the Lord and the Virgin of Matará and taking the name Sister Mary of the Holy Family." Is grass-fed beef the culprit? What's in the water of Westphalia and Fowler, Michigan? Please share it with the rest of us! “I RESISTED it at first but then realized that it would be good for me and the community to get some answers.” —Father Greg on his diagnois. While still in temporary vows Father Greg Schill, S.C.J. was diagnosed with Asperger's, a developmental disorder. He naturally "worried that the diagnosis would affect his ability to move forward toward final vows and ordination" as a Priest of the Sacred Heart. Read more about Father Greg's journey of acceptance and advocacy as well as brief profiles of other Priests of the Sacred Heart community. ORANGE IS THE NEW BLACK character Sister Ingalls (left) is really Dominican Sister Ardeth Platte. The very popular Netflix series Orange is the new Black (OITNB) character Sister Ingalls is inspired by pacifist nun Sisters Ardeth Platte, Jackie Hudson, and Carol Gilbert. According to the Common Dreams site, Platte, along with Hudson and Gilbert, "were arrested in October 2002 after they allegedly cut a chain link fence surrounding a Minuteman III missile silo in northern Colorado. The nuns then used baby bottles to dispense their own blood in the shape of a cross on the silo." Character Sister Ingalls and Sister Ardeth lived in their "camp," serving their time as well as serving as chapel clerk and ministering to women of many faiths. And post-camp life, the real-life-Domincan Sisters Carol, Ardeth, and Jackie continue to advocate for peace and justice. I remember my sacred Holy Land trip from 2008 often. The day after Easter I was given the wonderful opportunity to embark on a pilgrimage as a Catholic educator with other instructors hosted by the Jewish Federation of Greater Los Angeles. Because of the beautiful interfaith discussions and subsequent friendships that blossomed, my trip to Israel still ranks number one. The overwhelming tug of my faith heart strings still feels fresh with each step through the plush green hills of the Galilee to the cobbled crowded arcades of the old city of Jerusalem. I can't help but feel nostalgia as Pope Francis begins his journey to the Holy Land. The pilgrimage experience, particularly to the Holy Land, is something every Christian should experience once in their lifetime. Read the official itinerary of Pope Francis' visit to the Holy Land here. In an unprecedented move, Francis asked two friends from Argentina to accompany him to the Holy Land, Rabbi Abraham Skorka and Islamic studies professor Omar Abboud. Francis will pray with Syrian refugees in Jordan on Saturday. He'll then travel to Bethlehem, Jesus' birthplace in the Palestinian territories. Finally, he'll visit Jerusalem. "He'll also commemorate the 50th anniversary of a historic rapprochement between the Catholic and Orthodox churches. And he'll appeal for an end to the Christian exodus from the Middle East, where more and more Christians are dying in recent conflicts. The Old City of Jerusalem in 2008. Sr. Rosemary Nyirumbe holding a pop tab purse made by her St. Monica's Girls' Tailoring School students in Gulu, Uganda. Last week the Global Sisters Report highlighted an extraordinary Sacred Heart of Jesus Sister from Uganda-Sr. Rosemary Nyirumbe. Perhaps you remember her as one of 2007 CNN’s Heroes or as the recent keynote speaker for the 2014 TIME Magazine -The 100 Most Influential People in the World. View the Official Website for the Documentary Film and Book Sewing Hope here. REBECCA GUTHERMAN, a senior at Immaculata University, blogs about her plan to join the Sisters of the Immaculate Heart of Mary or the Sisters of the Holy Family of Nazareth. The growing trend of blogging, social media communities for discerners, and other resources like VISION Vocation Match attract and connect many millennials on their journey to religious life online. VISION also has a Blog Index. The Philadelphia Inquirer recently interviewed millennial Becca Gutherman about her blog, “Road Less Traveled” (the title a nod to Robert Frost’s “The Road Not Taken”) and her journey to becoming a nun. What other online ways have you witnessed millennials discern? As we prepare for the canonizations of Blessed Pope John Paul II and Blessed Pope John XXIII, I stumbled upon a couple of quotes that continue to inspire purpose and vocation in life. "I invite you all to pray for those young people who, throughout the world, hear the call of the Lord and for those who may be afraid to answer that call. May they find educators at hand to guide them! May they perceive the grandeur of their vocation: to love Christ above all else as a call to freedom and happiness! Pray so that the Church may help you in your search and in arriving at a correct discernment! Pray so that Christian communities may always know how to pass on the call of the Lord to the younger generations! With me, thank the Lord “for the gift of a vocation, for the grace of priesthood, for priestly vocations throughout the world” (Gift and Mystery, 10)! Let us thank him for consecrated persons! Let us thank him for families, parishes, and movements, the cradles of vocations!" Lent may be over, but I came across a funny post on the blog of the Benedictine Sisters of Perpetual Adoration about them imagining what it would be like if their community practiced the medieval monastic custom of having a funeral service and burial for the butter, lard, and fat the monks were giving up for Lent. The post also has some good reflections on how "discerning a life choice such as whether to enter a religious community will entail burying a few things": Amuzing Grace - Confessions of a Vocation Director. The Sisters of Bon Secours' new website connects women on their journey to religious life. In an age where advances in technology can sometimes disconnect us, I must say that the "Imagine a Sister's Life" website welcomes the visitor in very real way. This site offers a conversation starter for women both struggling to find their purpose or need confirmation that they're on the right path. With a wide array of multimedia tools, "Imagine a Sister's Life" invites visitors to explore religious life by exploring three steps that are outlined on the home page: 1. Meet a Sister, 2. Picture Yourself as a Sister, and 3. Becoming a Sister. Don't forget to click the "Talk to a Sister" tab to view their blog, join the chat room, and even send a comment or suggestion. Click Sisters of Bon Secours to discover more about this innovative community. Mercy Sr. Camille D'Arienzo, whose column Conversations with Sr.Camille is regularly featured in the National Catholic Reporter (NCR), recently posted two great interviews with members of religous communities: Providence Sr. Susanne Gallagher, S.P. on her work with children with special needs, and Marist Br. Sean Sammon, F.M.S. on the future of religious life. Providence Sr. Susanne Gallagher, right, with her sister Rita who inspired her work with Special Religious Development, better known as SPRED. Sr. Susanne, a recent recipient of the University of Notre Dame's Laetare medal, said that her interest in special education was due in part to the fact that her younger sister has Down syndrome: "I had been praying for a way to commingle my work and my prayer life and to become involved with people who are intellectually challenged, said Gallagher. ... I sensed that SPRED ministry would be a place where I would become more aware of God's presence in my life." Br. Sean Sammon, F.M.S., says that religious life is meant to be a leaven within the church and society. Br. Sammon told Sr. Camille that there has never been a "golden age" of religious life. "Each era has had its challenges. We need to use our energies to address today's, including the changes that very few welcome. ...Young people coming to religious life today are reminding us that community and a vibrant life of prayer are as important a part of religious life as the ministry of our congregation." Learn more about the Marist Brothers. “She was a bit of a flirt, entertaining and witty, and a woman who didn't easily take no—even from the men who were technically her superiors.” Does this sound like a cloistered nun, mystic, and Doctor of the Church? asks VISION Content Editor Carol Schuck Scheiber. SAINT TERESA OF AVILA by Peter Paul Rubens. Yes, if you’re talking about Saint Teresa of Avila, whose 500th birthday will be in about a year from now, March 28, 2015. Patricia Morrison, editorial director of ICS Publications, is a life-time student of all things Carmelite, and those are her words about the Teresa the saint. “She was a flesh-and-blood woman dealing with the same kinds of challenges and issues people do today,” said Morrison. Originally sent to the convent by a strict father who wanted his daughter reined in, she eventually became a tireless reformer of the Carmelite religious order, mystic, and author of books on prayer still being published today. #suorcristina hopes to get a call from #popefrancis next after her show stopping performance on The Voice of Italy. All four judges turned their chairs as 25 year old Ursuline Sisters of the Holy Family, Suor Cristina belted out Alicia Keys’ “No One,” on The Voice of Italy singing competition show. As Catholic News Agency reports: “A native of Sicily, Sr. Cristina arrived at the show accompanied by four sisters from her community, as well as her parents. The four judges of the popular TV program are the Italian singers Raffaella Carra, J-Ax, Noemi, and Piero Pelu. After her performance, Carra asked Sr. Cristina if she is really a nun, and why she chose to compete on the show. “Yes, I am truly, truly a sister,” she replied. The final remarks of the article include Cardinal Gianfranco Ravasi, president of the Pontifical Council for Culture’s stamp of approval using the trending hashtag #suorcristina he tweeted: “Each of you should use whatever gift you have received to serve others (1 Peter 4:10)”. Read the full Catholic News Agency’s article here, The UK Daily Mail’s coverage here, and what the Huffington Post said here. Jimmy Fallon thought he "had the calling"
"It’s my first experience on stage is as an altar boy. You’re on stage next to the priest, I’m a co-star," Jimmy Fallon on growing up Catholic and wanting to be a priest. Deacon Greg Kandra reminded us on his blog that in the wake of Jimmy Fallon's succesful debut as the new host of "The Tonight Show," Fallon wanted to be a priest. Deacon Greg recalls Jimmy Fallon's 2012 interview with NPR about his Catholic upbringing in Brooklyn, NY. Fallon shared: "I just, I loved the church. I loved the idea of it. I loved the smell of the incense. I loved the feeling you get when you left church. I loved like how this priest can make people feel this good. I just thought it was – I loved the whole idea of it. My grandfather was very religious, so I used to go to Mass with him at like 6:45 in the morning, serve Mass. And then you made money, too, if you did weddings and funerals. You’d get like five bucks. And so I go ‘Okay, I can make money too.’ I go, ‘This could be a good deal for me.’ I thought I had the calling... It’s my first experience on stage is as an altar boy. You’re on stage next to the priest, I’m a co-star." Read the full 2012 NPR transcript here. SISTER STORY website launched during the first National Catholic Sister Week. The National Catholic Sister week has successfully concluded and created a lot of buzz for women religious. Attendee Sister Paule Pierre Barbeau writes on her blog: "This new tradition [NCSW] is sparked by the funding obtained by St. Kate’s [St. Catherine’s University in St. Paul, MN] from the Conrad N. Hilton Foundation for a 3-year project called “Sister Story.” One of the goals of this project is to demystify religious life by collecting the personal stories of Sisters from various communities/congregations from all over the nation. To accomplish this, college women are being paired with Sisters with the goal of forming close relationships that will culminate in a videotaped interview which will be made accessible on a public website." The sisterstory site Sister Paule is referring to, provides an opportunity for viewers to participate in the "Tell Us Your Story" tab which includes thanking a nun. Particularly noteworthy is the SisterStories tab itself. It is quite incredible to read the "In their own words" stories as the Huffington Post acknowledged their blog a wrap up of the NCSW: "Let's Hear It For The Nuns! 7 Stories To Kick Off Inaugural National Catholic Sisters Week." Enjoy being demystified by these remarkable stories as I am. What will you eat this Fat Tuesday? Here are a few articles that help remind us what Fat Tuesday a.k.a Shrove Tuesday is all about as we prepare to fast, repent, and pray during this upcoming season of Lent. From the UK Edition of the International Business Times: Pancake Day 2014: What is it and Where Did it Come From? (features pancakes and packzi's). The L.A. Times give us: Mardi Gras: Celebrate with king cake and 16 additional recipes! And finally from Patheos-Hosting the Conversation on Faith's article on Ash Wednesday from the point of view of an evangelical American Christian: What is Ash Wednesday? How Do We Observe Ash Wednesday? Why Should We Observe Ash Wednesday? How Ash Wednesday Enriches Our Lives and Our Relationship with God. We first introduced Holy Child of Jesus Sister Megan Rice S.H.C.J., Greg Boertje-Obed, and Michael Walli, to you in a blog post from June 2013 as charges and convictions were made. Last week many news outlets including The Guardian reproted that: "An 84-year-old nun was handed a 35-month jail term on Tuesday for breaking into a US nuclear weapons plant and daubing it with biblical references and human blood. Sister Megan Rice was sentenced alongside two co-defendants, Greg Boertje-Obed, 58, and Michael Walli, 64, who both received 62-month terms." "In a recent interview with the Guardian from prison, Rice said she hoped U.S. district judge Amul Thapar would seize the opportunity to "take his place in history" and sentence them in a way that would reflect their symbolic, non-violent actions–actions she said were intended to highlight the US stockpile of nuclear weapons they believe is immoral and illegal." "Precarious monasteries reveal faith close to the edge"
A friend of mine pointed me to this item on the Huffington Post, a pictorial about monasteries from various religious traditions which are perched on—and sometimes in—mountains, cliffs, and so on. The photos alone are worth a look. One of the greatest gifts from the Olympics for me is that the world in solidarity and peace admires and cheers on the incredible talent and skill of athleticism executed in a variety of events. But before we get caught up in the medal count, here are a couple articles with great inspirational advice to remember during these games. Who and how will you cheer now during these Olympic games? the monastery, assists a bride with her dress. Photo: Nadia Shira Cohen for The New York Times. For years the monastery of St. Rita in Cascia has operated a secondhand wedding dress depot, once frequented mostly by young women from disadvantaged families. Why? Because, says the New York Times, “The monastery—once home to Saint Rita, an abused bride and a widow before becoming a nun about 600 years ago—has long been a pilgrimage site for Italian women, who come to pray to the saint to protect their marriages. The collection, as it were, began when some women brought their wedding dresses as an offering of thanks. “But as Italy continues to suffer from the fallout of a prolonged recession, what was begun as an act of charity for a few young women in need has become a trendy choice for growing numbers of brides who want to keep their wedding costs down. “In the process, the atelier has become a full-time job for Sister Maria Laura, who oversees an expanding collection of donated wedding gowns—now numbering in the hundreds—in various sizes, train lengths, and styles. The full story in the New York Times. If their track-record continues, the Benedictines of Mary, Queen of Apostles in Gower, Missouri may end up with another No. 1 album when their third recording, Lent at Ephesus, is released Feb. 11. Their previous albums, Angels and Saints at Ephesus and Advent at Ephesus, spent a total of 19 consecutive weeks at No. 1 on Billboard magazine’s Classical Traditional Music chart. In addition, the community of contemplative sisters was named Billboard’s Classical Traditional Artist 2012 and 2013; they're the first order of nuns ever to win an award in the history of the magazine. Last year Angels and Saints also reached No. 8 on the Overall Classical Music Chart, fending off competition from Fifty Shades of Grey: The Classical Album and Downton Abbey: The Essential Collection. 2) With this positive outlook on the past, he continued, “we want to ‘embrace the future with hope’— the second objective. 3) This hope cannot keep us from “living the present with passion” — and this is the third objective of the coming Year. . . . In this regard, the Year of Consecrated Life will have an evangelical focus, helping people to realize “the beauty of following Christ” in the various types of religious vocations. The Year of Consecrated Life is expected to begin in October of 2014, coinciding with the 50th anniversary of Lumen gentium, the Second Vatican Council’s constitution on the Church, which has a specific chapter dealing with consecrated life. The anniversary of the publication of Perfectae caritatis, the Council’s decree on the renewal of consecrated life, will be the occasion of the close of the Year in November 2015. Learn more here. Be sure to look to the VISION Vocation Network for resources and information on consecrated throughout the year. iBenedictines, a blog hosted by the Benedictine Nuns of Holy Trinity Monastery, Herefordshire in the U.K., is not only in the VISION Vocation Network's Blog Index and is one of the this week's VISION Blogs of the Week—it's also the winner of the 2013 Christian New Media Blogger of the Year award. in the faith sharing oral history project of the Sisters of the Holy Cross. In her Intro. to Communication Studies course, Saint Mary's College (Notre Dame, IN), assistant professor of communication studies Marne Austin, Ph.D, challenged her students to "engage directly with their communities" with an oral history project assignment. Austin's assignment was simple: One or two students would be paired with a Sister of the Holy Cross (the congregation's motherhouse is on campus) and meet five times over a five-week period to get to know one another, collect oral histories of the sisters’ faith experiences, and create a video archive for the College and the congregation. Read the full journey here of how this "class project evolved into eye-opening, intergenerational experiences of faith sharing and friendship for both the undergraduate students and the sisters, most of whom are age 70 or older." I have a feeling this getting-back-to-basics oral history project will effect these students as well as the Sisters of the Holy Cross community of Indiana for the rest of their lives. Are you challenged to do your own oral history project now, like I am? First "official" Trappist beer brewed in U.S.
BREWERY director Father Isaac at the Spencer Brewery in Spencer, Mass. ; Trappist monks of St. Joseph's Abbey new "Spencer Trappist Ale," the only certified Trappist beer brewed in the U.S.
eight monasteries that produce "the only beer recognized by the International Trappist Association as authentic Trappist beer" with their Spencer Trappist Ale golden beer. Read the full article about the "journey from jams to beer started five years ago when St. Joseph's sent two monks on a fact-finding mission to the Belgian Beer Fest in Boston." Cheers to the St. Joseph's monks and their success with "Trappist Preserves"—and now their "Spencer Trappist Ale" which is approved by their European counterparts! Discover more about Trappist Cistercian communities. FATHER PETER Banks in Los Angeles. The PBS program Religion & Ethics Newsweekly recently ran a story on Father Michael Doyle, a diocesan priest who has worked for 40 years in Camden, New Jersey, which the FBI considers the most dangerous city in America. The item also has a link to R&EN's 2009 segment on Irish Franciscan Father Peter Banks, who had also worked for nearly 40 years in another difficult urban setting, the Watts neighborhood of Los Angeles. SISTER Joan Sawyer in Lima. A reminiscence in The Guardian (U.K.) from Irish woman Hilary Georgina Cross as she got ready to visit Lima, Peru for the 30th anniversary of the martyrdom of her aunt, Columban missionary Sister Joan Sawyer, who died at the hands of government forces after being taken hostage by prisoners.